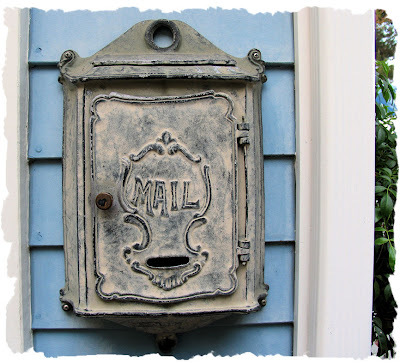 The Blog Formerly Known As The Blue Cottage: The Mails Here! I reached in pulling out phone, cable and car insurance bills....the usual suspects this time of month...then my eye caught a glimpse of something unusual...Royal Mail...what the ____?! And not one set, but TWO! The monthly bills were much easier to face today - thanks to Kate's Random Act Of Kindness! OWL mail is always good. It's the howlers that you don't want. Dagny: the only howling was ME when I saw the Royal Mail :) But howling in a "Wolfman Jack" sort of way...LOL! I bet I just lost a lot of my younger readers with that reference!!! I'm deep into the latest HP right now. OH!! What a fun surprise!! I'm gonna have to go check out ebay and see about getting some of those too cool stamps!!! Always a pleasure and never a chore! :D Glad you enjoyed them, knowing you're a fan of the young HP. 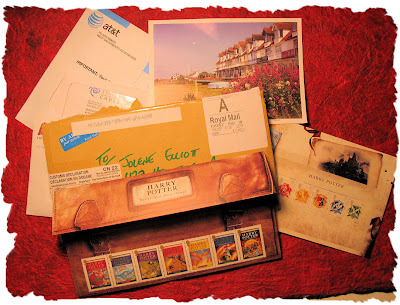 Wonderful Royal Mail! Couldn't have gone to a better household and that's the truth! Oh, and btw, thanks Jolene. Wolfman Jack's howl is forever embedded in my head for the rest of the evening. There it goes again. LOL!